Matt Young and Denise De Carion thought they had seen about all there is of fish communities in the Sacramento-San Joaquin Delta. They had surveyed nearly the entire web of channels using electrofishing boats in their years of assisting environmental researchers at UC Davis. 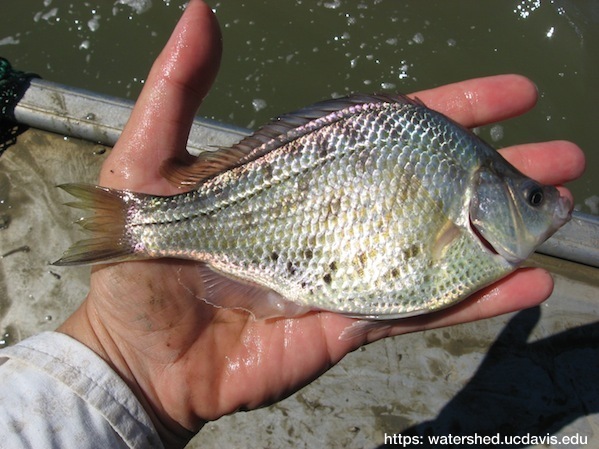 In all their dozens of sampling runs, the story was the same: the Delta supports predominantly non-native species such as bass, catfish and bluegill sunfish – the garden variety found in almost any North American warm-water lake. Then, in 2011, the story changed. Young and De Carion were helping the California Department of Water Resources explore fish populations in the north Delta, a region they had never surveyed and that no one had comprehensively sampled. They focused on the region below Liberty Island, where the natural Cache and Lindsey sloughs merge with the human-made Sacramento Deep Water Ship Channel and toe drain of the Yolo Bypass. Matt Young has a deep affection for California native fish, including this Sacramento blackfish, which is native to the Delta. They were surprised. 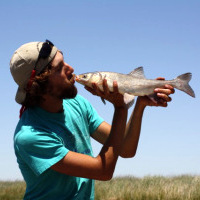 Rather than the typical catch of mostly non-native warm-water fishes, they netted a mix of natives and non-natives – predominantly river and estuary species such as tule perch and Sacramento splittail. The diversity and abundance of fishes rivaled that found in Suisun Marsh, a brackish wetland that UC Davis fish biologist Peter Moyle has studied for more than 30 years. The Cache Slough region had the same qualities that drew professor Moyle to Suisun Marsh: a natural landscape, abundant waterfowl, complex habitat that favors many aquatic and avian species and lots of native fishes. Less than 150 years ago, the Delta was dominated by such landscapes. Sloughs snaked though tule marshes. Upland marshes graded from willows to oak trees atop low banks. Little of this habitat remains in today’s intensively farmed Delta. In fact, the island topography in many places is inverted: river channels are actually higher than the adjoining farms, ringed with levees rip-rapped with rocks and concrete blocks. Most of the channels have been straightened to speed water transport. And much of the Sacramento River flow is diverted across the eastern Delta to pumping stations in the south for agricultural and urban uses. The vastness of these human alterations make the Cache Slough-area find all the more important. The realization inspired researchers at the UC Davis Center for Watershed Sciences to investigate what now appears to be an arc of habitat that supports native fish. 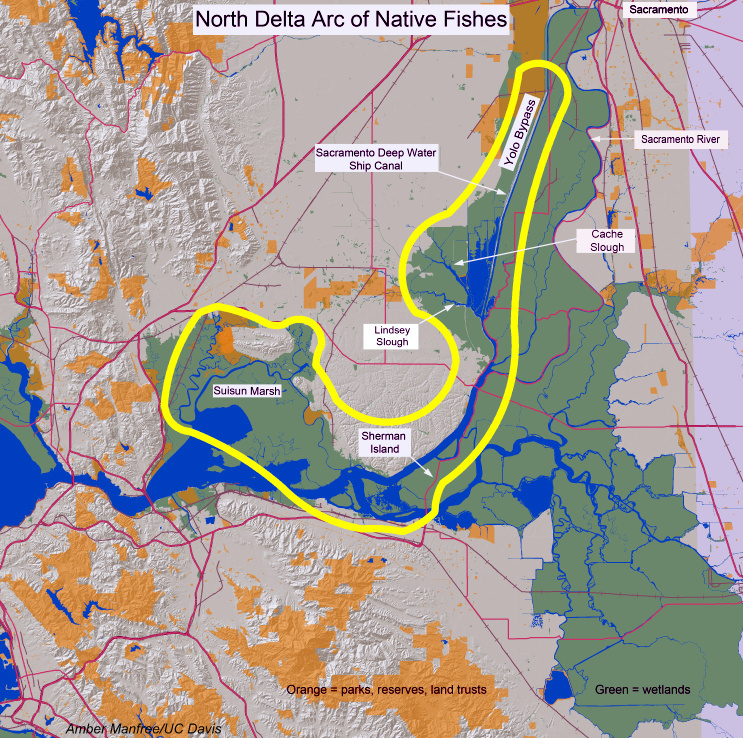 The North Delta Arc of Native Fishes, as we call it, extends from Suisun Marsh at the eastern edge of the San Francisco Estuary to the flooded Sherman Island near the confluence of the Sacramento and San Joaquin rivers, on up to the Cache Slough region. Young and De Carion are now graduate students working with Moyle, myself and research scientist James Hobbs at UC Davis on a study to understand how the arc supports native fish diversity. • How do native fishes use habitat on slough margins and adjacent floodplains? • Do regional food webs support endangered aquatic species such as delta smelt? • How do small sloughs support migratory species such as splittail and salmon? • Are some restored or artificial habitats better for native fishes than others? We will present preliminary findings from our first year of research on Oct. 29 at the State of the San Francisco Estuary Conference in Oakland. The studies are expected to provide a better understanding of how land and vegetation interact with river flow and tides to create habitat favored by native fishes. Scientists, engineers and resource managers can then use this information to identify areas and conditions of high potential for habitat improvement throughout the Delta. While the problems in the Delta are challenging and vast, the potential remains to create productive ecosystems for both fish and people, and to preserve some of the natural biodiversity that dominated the region just a few generations ago. John Durand is a doctoral student in fish ecology at the Moyle Laboratory and the Center for Watershed Sciences at UC Davis. Lund, J., Hanak, E., Fleenor, W., Bennett, W. & Howitt, R. Comparing futures for the Sacramento-San Joaquin Delta. (University of California Press: 2010). Nobriga, M.L., Feyrer, F., Baxter, R.D. & Chotkowski, M. Fish community ecology in an altered river delta: spatial patterns in species composition, life history strategies, and biomass. Estuaries and Coasts 28, 776–785 (2005). Matern, S.A., Moyle, P.B. & Pierce, L.C. Native and Alien Fishes in a California Estuarine Marsh: Twenty-One Years of Changing Assemblages. Transactions of the American Fisheries Society 131, 797-816 (2002). Grimaldo, L.F., Miller, R.E., Peregrin, C.M. & Hymanson, Z.P. Spatial and temporal distribution of native and alien ichthyoplankton in three habitat types of the Sacramento-San Joaquin Delta. 81–96 (2003). Feyrer, F., Hobbs, J. & Sommer, T. Salinity Inhabited by Age-0 Splittail (Pogonichthys macrolepidotus) as Determined by Direct Field Observation and Retrospective Analyses with Otolith Chemistry. San Francisco Estuary and Watershed Science 8, (2010). This entry was posted in Uncategorized and tagged Delta, John Durand, native fish. Bookmark the permalink. July 1987. 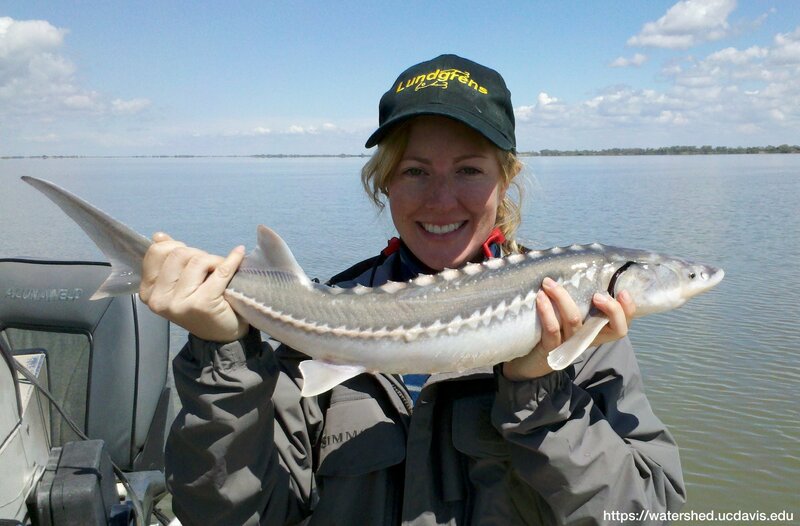 Urquhart, K. Associations Between Environmental Factors and the Abundance and Distribution of Resident Fishes in the Sacramento-San Joaquin Delta. 49 pp. + App. – summarizing the work of Dave Kohlhorst’s IEP- Resident Fish Program at the Central Valley/Bay-Delta Branch, and earlier CDFW Region 2 work in Ranhco Cordova files. Kevan, thanks a lot for the reference! I’ve been looking for a report from that data for awhile. Brown & Michniuk 2007 is a good source too. Do you know much about the actual sampling site locations from the randomly stratified 1980’s data?